My kids love all the creepy crawly and flying insects that come out in summer. They get so excited when they spot a butterfly, ladybug, potato bug (which we like to call rollie-pollies), and especially Dragonflies. 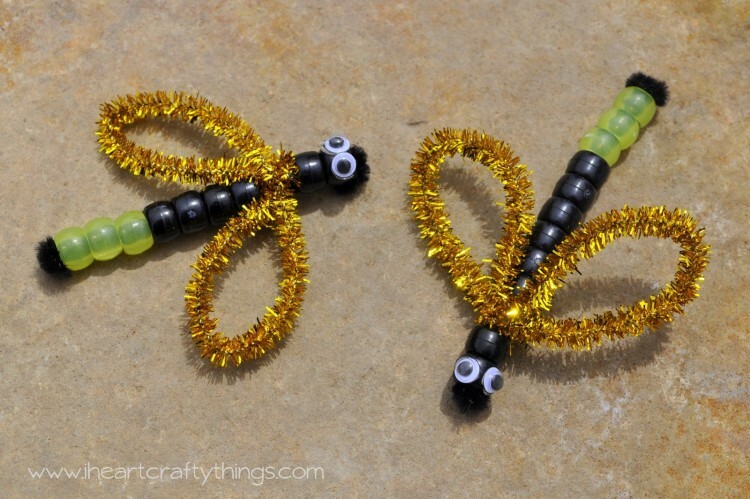 One night this fun idea hit me of how we could make our own Dragonfly and Lightning Bug (aka Firefly) out of pony beads and pipe cleaners and I’m thrilled with how the idea came together! All of the Pony Beads, Fuzzy Sticks and Wiggly Eyes we used in this project were given to us from our friends at Craftprojectideas.com. All opinions expressed are 100% our own. You can purchase all of their products at your local Walmart in the arts & crafts section. 1. Cut about 1 1/2″ off of your blue neon fuzzy stick and then fold it in half. 2. Begin to bead a couple of the blue pony beads onto the fuzzy stick close to the other end of the fuzzy stick. Twist the end a couple times and then fold it over the last bead to hold all the beads in place and to keep them from falling off. 3. 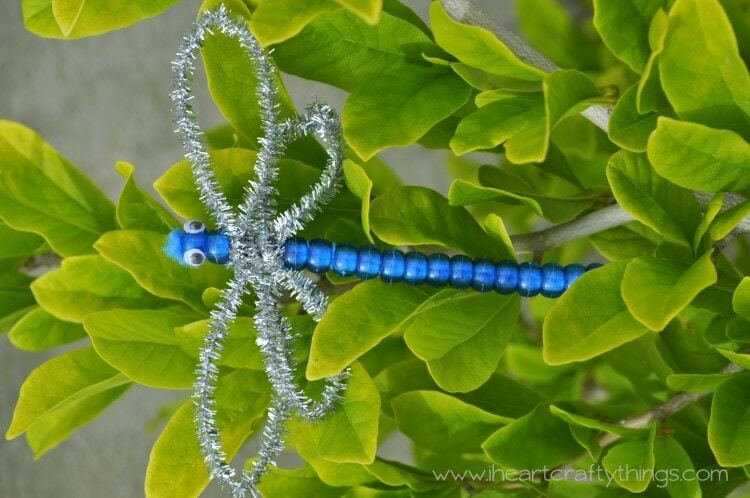 Continue adding beads to the fuzzy stick until you nearly reach the end. As you can see in the first picture below, I left a small space between my last two beads on the fuzzy stick. You will want to do the same so you have a space to add the wings on. 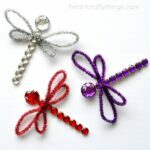 After your last bead, twist the end of the fuzzy stick a couple times and fold it over the last bead to secure it in place. 4. 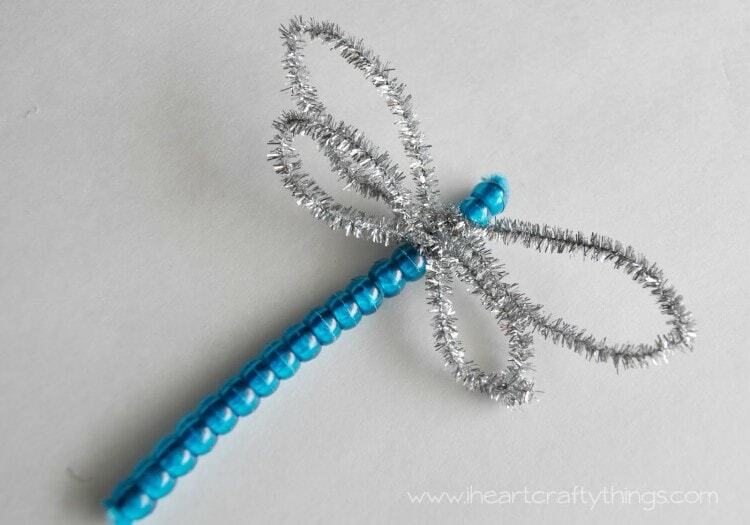 To get the wings ready, take your first silver shimmer stick and fold it in half. 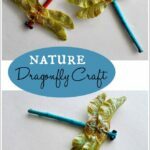 Twist the ends together to join them in a circle and then pinch down the center of the circle to form oval shaped wings. Twist the shimmer stick once in the center for it to keep it’s wings shape. 5. For the second pair of wings, cut about 2″ off of the shimmer stick and then complete step 4 again to make a smaller pair of wings. 6. Place the larger wing in the opening you left on the blue fuzzy stick. 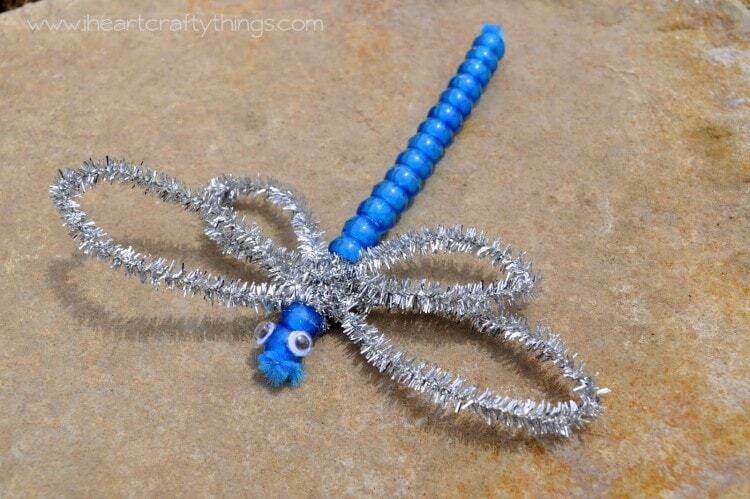 Twist the wings around the blue fuzzy stick once to secure it in place. Do the same with the smaller pair of wings underneath the large pair of wings. 7. 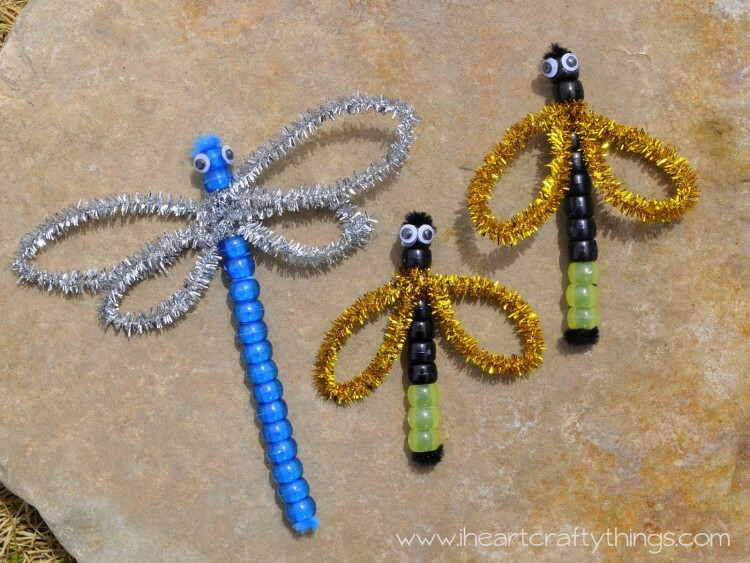 Finish your dragonfly by securing 2 tiny wiggly eyes onto the top pony bead with 2 glue dots. You could use a drop of hot glue if you don’t have glue dots. They look pretty stunning with the shimmery wings. My kids have had a lot fun playing hide-and-seek outside with their insects in the trees and bushes. 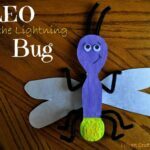 The Lightning Bugs were even more of a treat because we don’t have those were we live and we made them so their little ends do in fact actually glow in the dark! The only difference in making the Lightning Bugs as opposed to the Dragonfly is that I made them smaller and they only have one wing, instead of the two. So in Step 1, cut off about 3″ from your fuzzy stick. Continue with Steps 2 and 3. In step 4, cut off about 2″ from the fuzzy stick before making the wing. Continue with Step 6 and 7, but only using 1 wing instead of 2. We had a big discussion about what color to use for the wings for the Lightning Bugs. You may decide you want something different. My kids unanimously loved the idea of having gold wings that matched their glowing bottom and I thought it was fitting. 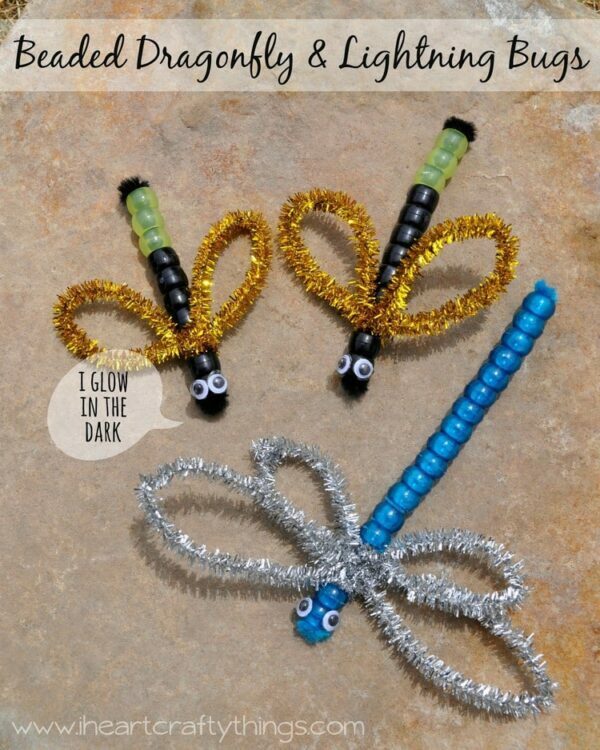 My kids have been in heaven with these little insects! I really hope you enjoy them as much as we have! These are absolutely adorable! And, my sister just gave us glow in the dark beads! Yeah!!! I know what we are doing this week!